This is a cubanelle pepper. I’ve seen them in the supermarket many times and always wondered what you used them for in cooking. Well, I know now! 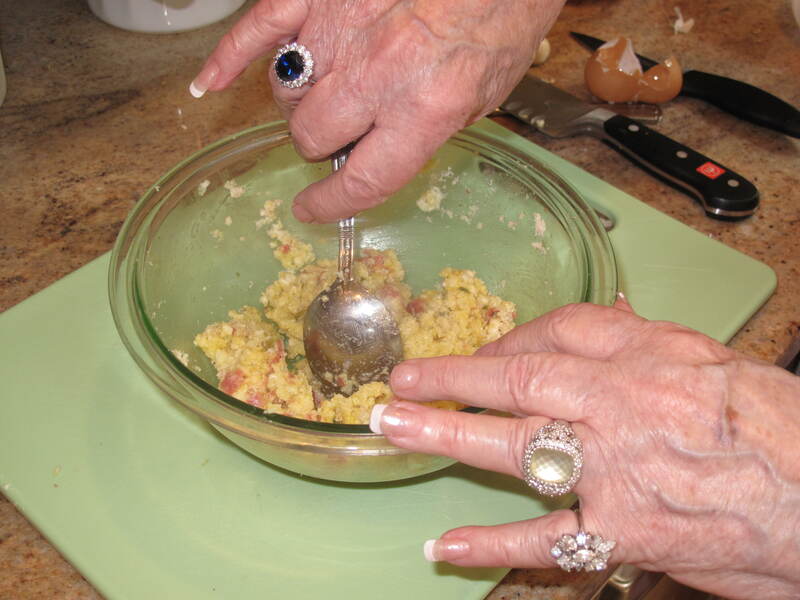 The Brooklyn Italian Grandmother is back, fully jeweled, and is making her version of Italian stuffed peppers using cubanelle peppers. She tells us that this is her own creation that she has come up with over the years through trial and error. What is unique about this dish is that you actually start by mixing and frying the stuffing. Once cooled, the fried stuffing is then placed in the peppers and baked until the peppers are tender. These are one of those dishes that seem to taste better the next day after all the flavors have settled and melded together. 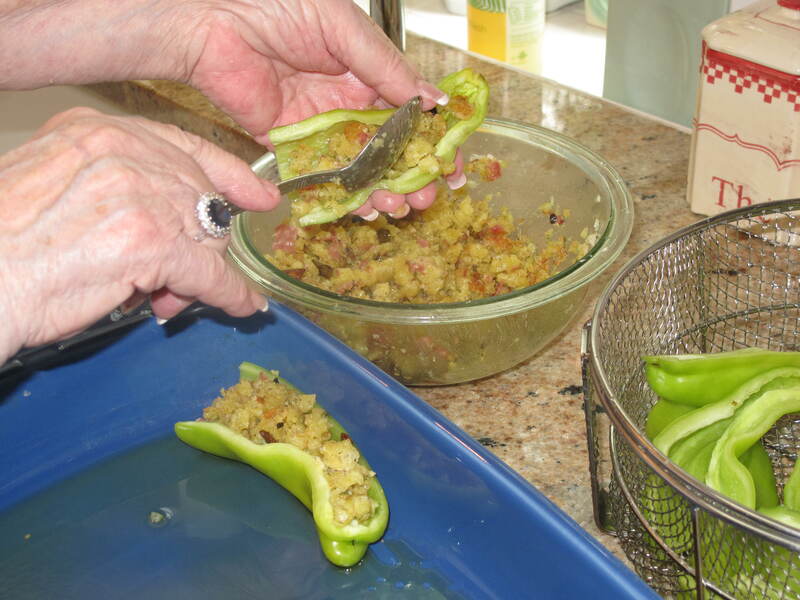 So let’s join our Brooklyn Italian Grandmother and make some funky Italian stuffed peppers…the cubanelle way. Preheat oven to 350 degrees. 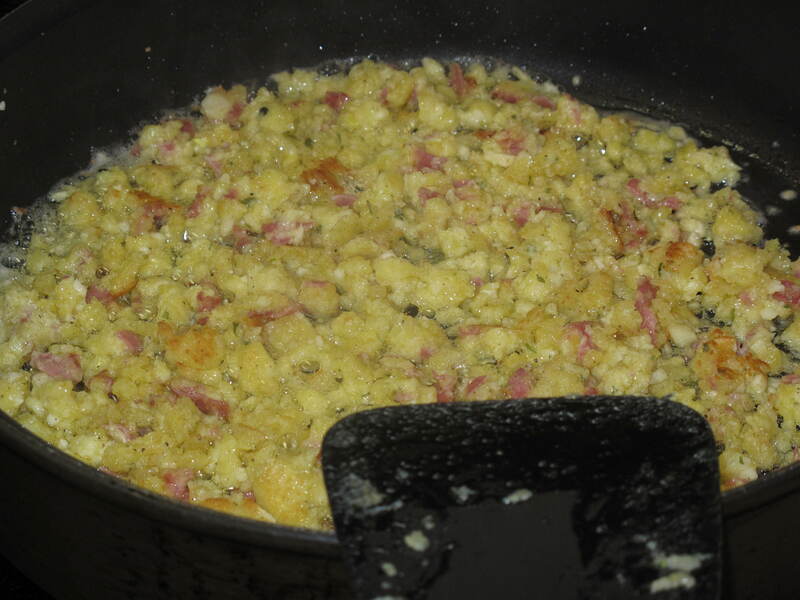 Mix garlic, eggs, bread crumbs, cheese, sopressata, salt and pepper in a bowl and combine well. Heat the olive oil in a skillet until hot. Put the mixture into the oil and fry it until it becomes golden brown. Hot stuff and I’m not talking about what’s in the skillet. 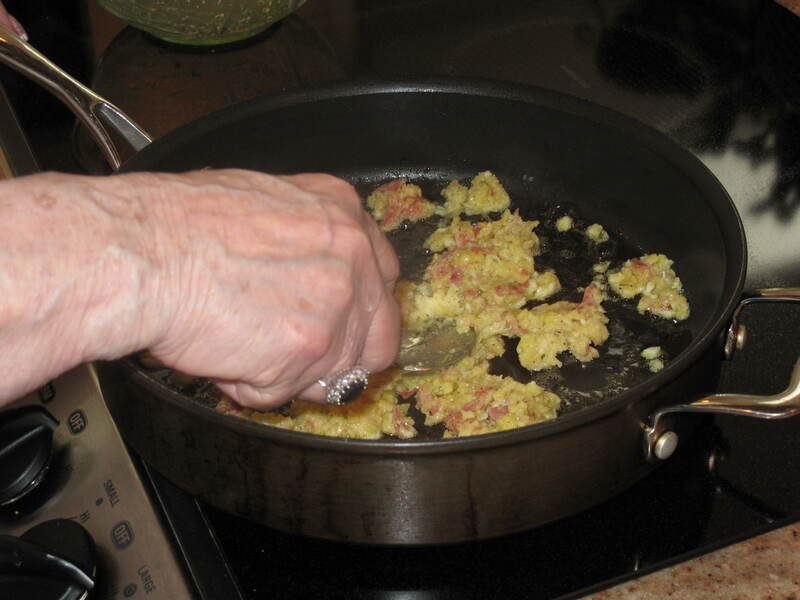 Take fried stuffing out of the skillet and place it into a bowl. Let it cool until it can be handled. 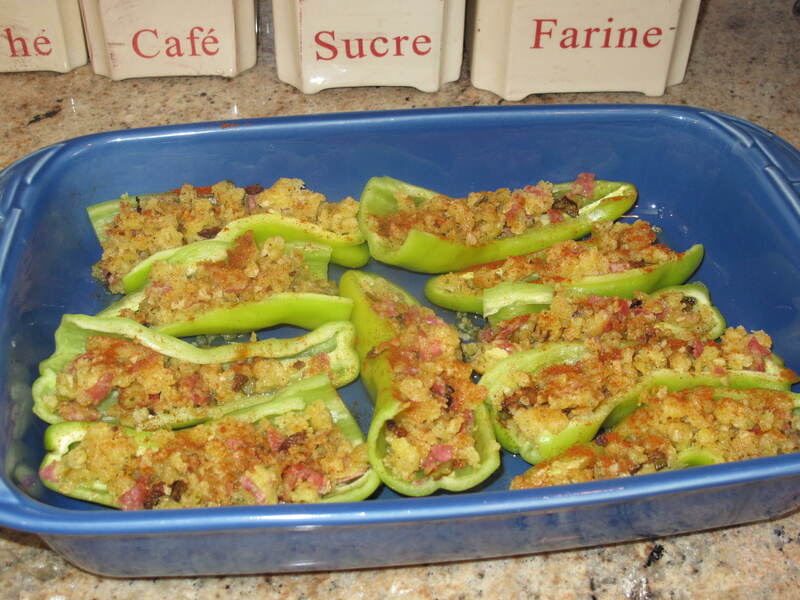 Stuff each pepper half with the fried stuffing and place stuffed pepper halves into a 9″ x 13″ baking dish. Always wear a ring that matches your baking dish. Sprinkle each stuffed pepper with paprika. Cover with aluminum foil and bake for about 25 minutes. When pepper begins to get tender, remove foil and continue cooking until pepper feels tender when pierced with a fork (about 10 more minutes). Remove from oven and drizzle balsamic vinegar over each pepper. 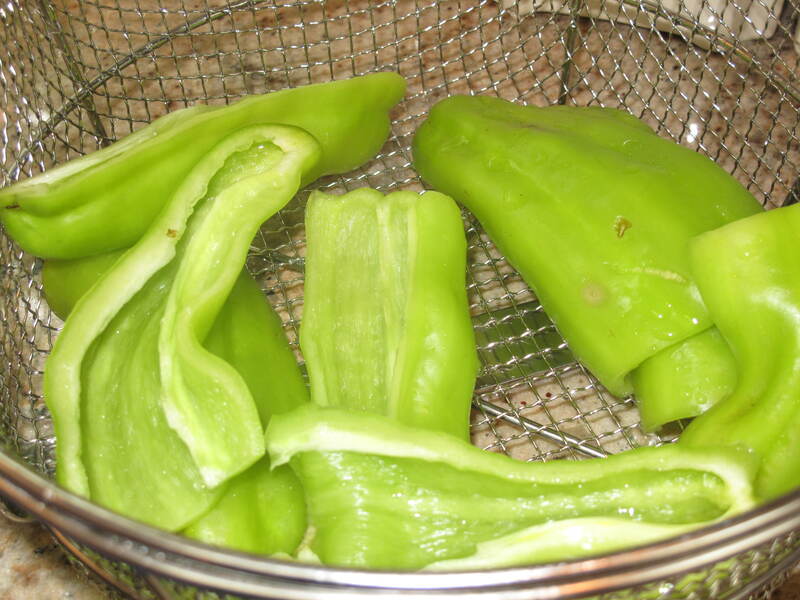 You can be the judge here on how you want to serve these wonderful peppers. They are great as a side dish and they can stand alone on their own and be a wonderful lunch. In fact, make enough so that they can serve both–side dish and lunch. I love the savory aspects of the stuffing along with the little flavor punch that the pepper and balsamic vinegar give this dish. If you are a stuffed pepper lover, this is the dish for you. What great Italian side dish recipes do you make and serve at your house? This entry was posted in Food and tagged Acorns, Baking, Blog, Cooking, Family, Food, Fun, Humor, Life, Love, My Life, Photos, Recipes. Bookmark the permalink. Ahh, that’s what those peppers look like. Wonderful recipe, love that it uses sopressata! I also love anything the Brooklyn Italian Grandmother makes. Also, did you notice she has the Middleton ring? You know she had it first! 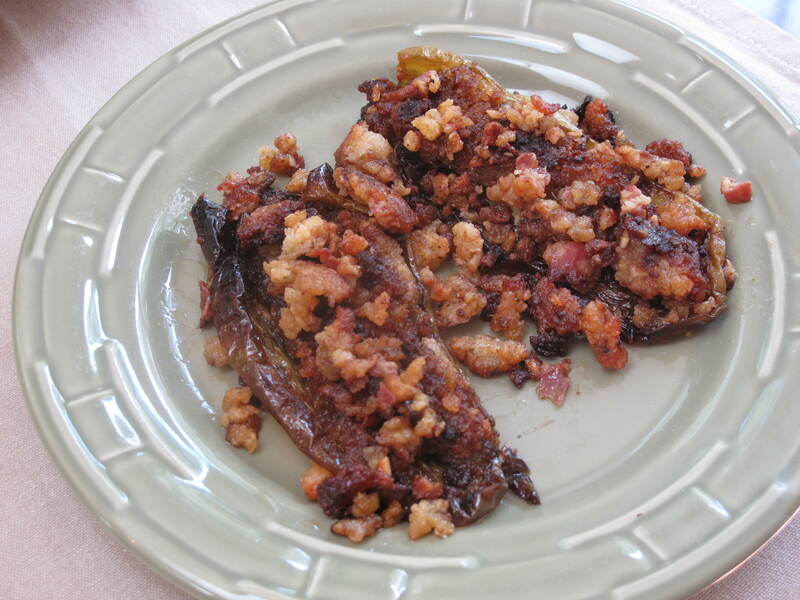 As to your question, tonight we’re trying marinated eggplant. Hi Rufus’. The eggplant sounds good. We should figure out some cross-blog Italian cook off one week where a bunch of us make our favorite Italian recipe and post it at the same time. Like an Italian week theme. So much more out there than just pasta and sauce. Hope you post the marinated egglant recipe. Oh that sounds fun. Brook.I.G. will probably smoke the competition though. I’ll post the eggplant recipe. I’m always behind, or should I say ahead?, on posts. In the meantime, have you seen this blog: http://fromthebartolinikitchens.com/. Talk about some great Italian recipes. Thanks for the blog. Some great stuff there. I think I’ll have to pull out of the Italian cooking competition if they play. Take care and talk to you soon. Loved stuffed peppers and these look delicous. Are the peppers hot or mild. Hi Carolkin. They are not hot at all. Pretty mild in taste. 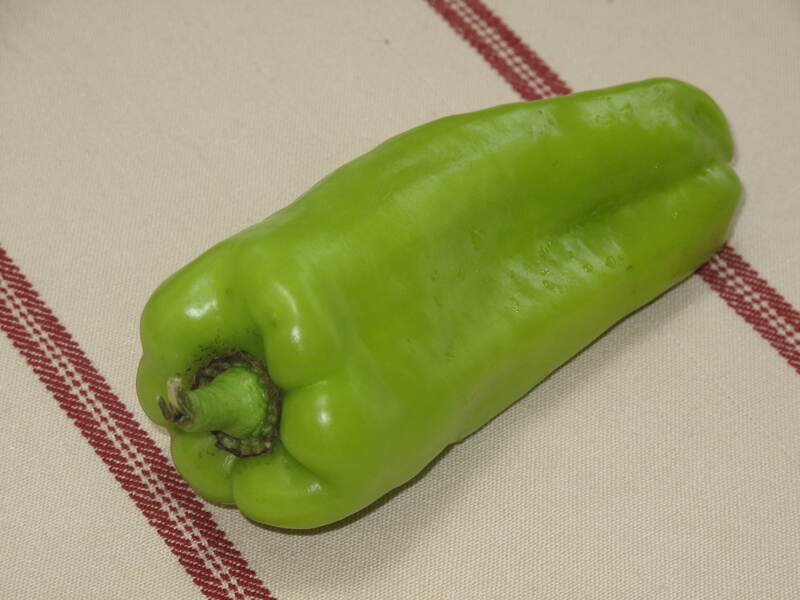 I think just a little milder than a regular green bell pepper. Hi Jessica. Welcome to Acorns On Glen. I hope you like these peppers. Cool website where you got your salt and peppercorns. I’ll have to spend some time looking at what else they offer. We put a lot of recipes out for all to enjoy. Come back and visit us soon and see what else we are cooking up.